"Hi Jim, want to come over and do microscopy stuff?" Got some burgers to grill, and other fixin's. It'll be fun." "Oh, hi, Marc. I should get out of here for a while. Listen, I need a break from the dinosaur soft tissues for a while. Got anything else?" "Well, I have some Giardia. We can stain them with iodine, and some with trichrome. They're cute." "Yes, they are. I can imagine constellations and stuff. Okay, I'll be over soon". There's a pathogen called Giarda that is an intestinal parasite which causes a disease called giardiasis. It's common, but many people have no idea they have it because there are no symptoms. Others get the colon explosion. Here is some health information about giardiasis if you're interested. Giardia trophozoites stained with trichrome. Giardia has some interesting traits where it does not infect some carriers and does not infect all humans. Further, there are some aspects of symbiosis. Creationists have some interesting ideas on how it was before the Fall. In addition, it thwarts evolution because of its distinct design, especially in its locomotion. 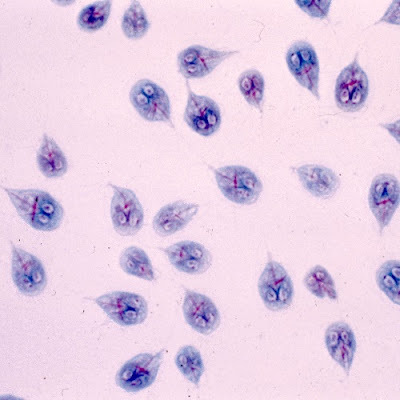 Giardia is a genus of protozoa discovered in 1681. Six morphologically distinct species are recognized. It mainly attaches in the upper GI tract of a wide variety of vertebrates (including zebrafish), often with beaver and muskrat as reservoirs/carriers but exhibiting minimal—if any—disease in some animals. Giardia is usually non-pathogenic in the human population, even in children if exposed early in life. Although Giardia can be pathogenic, some strains colonize the gut with no malady. This parasite is not invasive and only serious infections depress the small intestine. Giardia are pear-shaped, have an adhesive disc for attaching to enterocyte cells in the small intestine villus, and move with eight designed flagella. In the post-Fallen world, Giardia infection occasionally has resulted in digestive dysfunction. However, Giardia may function in non-parasitic, possibly mutualistic, ways. To read the rest of this rather long but well-illustrated article, click on "The Design of Giardia and the Genesis of Giardiasis".